We named this journey around the northwestern corner of California in honor of the famous resident of these forests primeval, the legendary sasquatch. But we could just as well have called it the Tall Trees Tour for all the quiet giants you’ll see while riding through four different national forests—Klamath, Six Rivers, Shasta, and Trinity—not to mention riding around or through the Marble Mountains Wilderness, the Trinity Alps Wilderness, and Redwood National Park. Or we could have called it the Wild Rivers Tour, because at one time or another, the route parallels or crosses the Shasta, the Klamath, the Salmon, the Trinity, the Van Duzen, the Eel, the Bear, and the Mattole Rivers, all of them pristine, untamed streams. In fact, about 70% of the entire route runs next to a river, a creek, a lake, or the ocean. The tour visits little towns, from Happy Camp to Hayfork, from Forks of Salmon to Ferndale (as pretty as Mendocino, but with half the tourists). Beyond Ferndale—on the far side of some steep hills—riders explore the Unknown Coast, one of the few stretches of California coastline without a major highway next to it. The tour ends up (after the long climb and descent over Panther Gap), rolling down the Avenue of the Giants, among the tallest trees on earth. Short route rolls gently downhill (most of the time) from Yreka to Happy Camp, at first along the Shasta River and then–for most of the day–along the banks of the beautiful Klamath River. Longer route explores the Scott River canyon before teeing into the Klamath. Extremely pretty and peaceful, and one of the easiest days on any tour we offer. Camp at a private resort on Elk Creek. Showers and all services. Begins with more tranquil, slightly downhill miles along the Klamath River, then follows the spectacular course of the Salmon River through a narrow, rocky gorge. 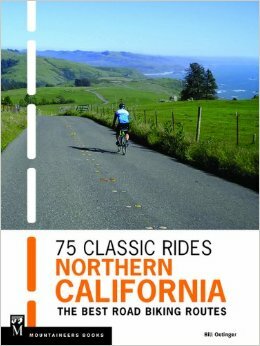 Some of the most exciting cycling miles imaginable! Camp in remote wilderness at a primitive forest service camp. No showers, but beautiful swimming holes are right next to camp. After two relatively easy days, with only moderate climbs, you now have to get to work: two very long (but rarely steep) climbs of 17 and 7 miles carry you up and out of the Salmon River watershed, over the Pacific Crest Trail, and down into the Trinity River system. The long climbs are followed by long, sometimes technical and exciting downhills. Overnight in a quiet, private camp on the bank of Coffee Creek. Showers. Jumbo-sized rollers through the pines are the order of the day for the first 38 miles to historic Weaverville. After exploring the old town, work your way up and over another long climb (7 miles) before descending to the remote hamlet of Hayfork. Camp on the shaded lawns of the Trinity County Fairgrounds. Showers. One of the best days on the tour! Long climbs through the forest, but even longer descents on beautifully paved, well-engineered roads…roads that are virtually free of traffic, in spite of their great condition. A cyclist’s dream. The latter half of the ride runs alongside the pretty Van Dusen River. Camp in the redwoods on the bank of the river. Showers. 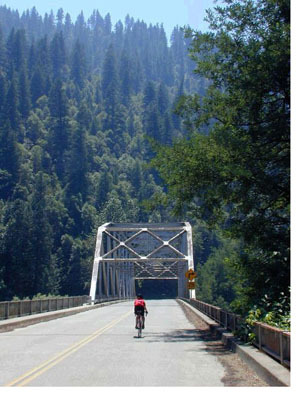 Begin in the redwoods along the Van Dusen, pedal through the town of Fortuna (biggest town on the tour), and then ride out across the fertile valley of the Eel River to the charming town of Ferndale, one of the best-preserved, prettiest pioneer towns in the west. After prowling the town, tackle several steep climbs and wickedly steep, twisting descents on the way over the coastal hills to the ocean. Camp in a remote, beautiful county park on the bank of the Mattole River (including a nice swimming hole). Showers..but only cold water! Leave the magnificent Unknown Coast by climbing (for 8 miles) over Panther Gap and dropping into Humboldt Redwoods State Park. Wind up the tour with a placid cruise down the Avenue of the Giants, the famous scenic byway through the tallest trees on earth. Finish up at Dean Creek Campground, where a swimming pool and showers will help wash away a week’s worth of wear and tear. Stay overnight or just wash up and hit the road for home.